KCNQ2/3 channels, ubiquitously expressed neuronal potassium channels, have emerged as indispensable regulators of brain network activity. Despite their critical role in brain homeostasis, the mechanisms by which KCNQ2/3 dysfunction lead to hypersychrony are not fully known. Here, we show that deletion of KCNQ2/3 channels changed PV+ interneurons’, but not SST+ interneurons’, firing properties. 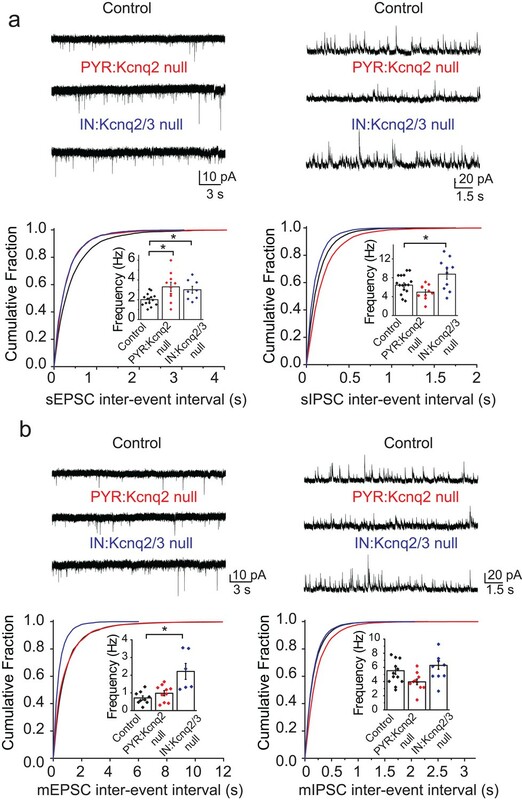 We also find that deletion of either KCNQ2/3 or KCNQ2 channels from PV+ interneurons led to elevated homeostatic potentiation of fast excitatory transmission in pyramidal neurons. Pvalb-Kcnq2 null-mice showed increased seizure susceptibility, suggesting that decreases in interneuron KCNQ2/3 activity remodels excitatory networks, providing a new function for these channels. Genetic studies have established that potassium channel dysfunction is responsible for multiple pediatric epilepsy disorders (Brenner and Wilcox, 2012; Geisheker et al., 2017; Niday and Tzingounis, 2018; Oyrer et al., 2018). KCNQ2 and KCNQ3 channels, in particular, have emerged as fundamental regulators of normal brain activity (Brenner and Wilcox, 2012; Geisheker et al., 2017). Pathogenic variants of these channels are strongly associated with early-onset neonatal epileptic encephalopathy and developmental disorders (Millichap et al., 2017; Mulkey et al., 2017; Oyrer et al., 2018). However, the network mechanisms by which KCNQ2/3 variants lead to hyperexcitability are not fully understood. KCNQ2/3 channels are expressed in both pyramidal neurons and interneurons (Cooper et al., 2001). In pyramidal neurons, KCNQ2/3 channels primarily control spike frequency adaptation, a quiescence period neurons enter following a brief train of activity (Peters et al., 2005; Soh et al., 2014). However, our knowledge of KCNQ2/3 function in interneurons is limited. This gap in knowledge is partly because KCNQ2/3 function is most easily observed in neurons that undergo pronounced spike frequency adaptation, a characteristic not traditionally found in interneurons (Pelkey et al., 2017). It is currently unknown whether loss of KCNQ2/3 function in interneurons would have effects on overall network activity, and if it does, whether it would lead to a dampening or an increase in excitability. Previous work suggests that loss of KCNQ2/3 function in interneurons would likely elevate their excitability (Lawrence et al., 2006; Pelkey et al., 2017), which in turn would increase GABAergic inhibition and decrease network excitability. However, at early times in development GABA is depolarizing due to shifted chloride equilibrium potential (Le Magueresse and Monyer, 2013). Previous work found that neonatal administration of bumetanide, which changes GABA receptor activity from depolarizating to hyperpolarizing, prevents seizures in mice with a global loss of KCNQ2 channels (Marguet et al., 2015). This may be evidence that loss of KCNQ2/3 function at this time increases network excitability through changes in interneuron GABA signaling, but the authors did not directly examine synaptic activity. Further, it is entirely unknown what effects KCNQ2/3 dysfunction in interneurons has on network excitability in juvenile and mature mice. In this work, we developed mice lacking KCNQ2 and KCNQ3 specifically in interneurons to address their possible role at the cellular and network activity. We found that KCNQ2/3 channels regulate interneuron properties in a cell type-specific manner. Deletion of KCNQ2/3 channels primarily impacts the firing properties of PV+ interneurons, but not SST+ interneurons. We also find that interneuronal loss of KCNQ2/3 or KCNQ2 channels increases excitatory transmission between pyramidal neurons, perhaps as homeostatic compensation for the increased GABAergic signaling we observe. To investigate the role of KCNQ2/3 channels in interneurons, we developed mouse lines that lack KCNQ2/3 channels specifically in parvalbumin-positive (PV+) and somatostatin-positive (SST+) interneurons, cell types known to express KCNQ2/3 channels (Cooper et al., 2001; Lawrence et al., 2006). We crossed Kcnq2 or Kcnq3 floxed mice (Kcnq2f/f and Kcnq3f/f) to Nkx2-1cre mice (Xu et al., 2008). The Nkx2-1cre driver is expressed starting early in development (~embryonic day 10.5) in SST+ and PV+ interneurons, allowing us to study the impact of KCNQ2/3 channel ablation in young and juvenile neurons. In order to identify the Cre-expressing PV+ and SST+ interneurons, we crossed these mice to a reporter line (Ai9) that expresses the fluorescent protein tdTomato in cells in which Cre recombinase has been active. We designated these mice as IN:Kcnq2/3 null (Nkx2-1cre;Kcnq2f/f;Kcnq3f/f;Ai9). 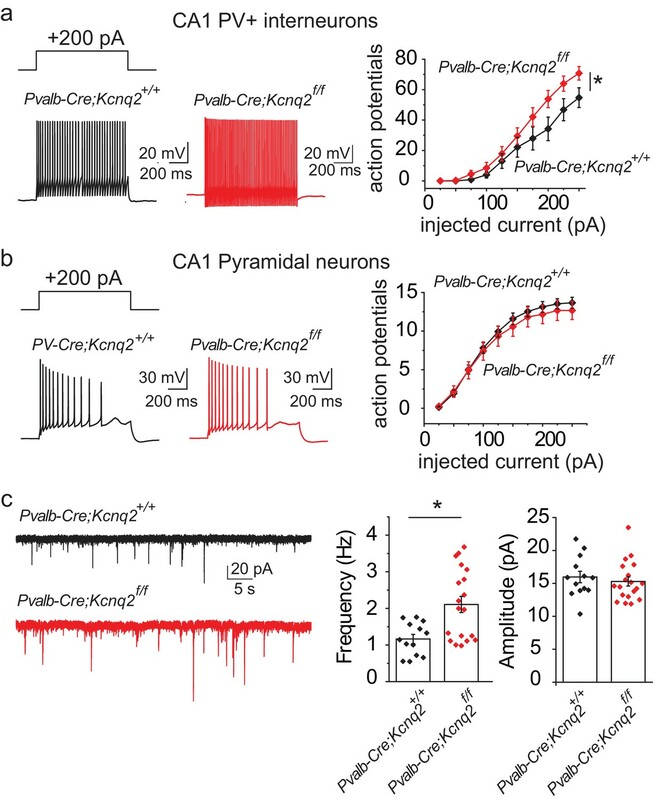 We first examined whether ablation of KCNQ2/3 channels from interneurons led to changes in the excitatory and inhibitory drive of CA1 pyramidal neurons. Based on previous work (Pelkey et al., 2017), we predicted that loss of KCNQ2/3 channels from PV+/SST+ interneurons would lead to increased inhibitory but not excitatory transmission. We recorded spontaneous inhibitory postsynaptic currents (sIPSCs) and excitatory postsynaptic currents (sEPSCs) from CA1 pyramidal neurons of IN:Kcnq2/3 null mice. These measurements are commonly used to detect synaptic input. We first focused our analysis on the second week of life, as KCNQ2/3 dysfunction is primarily associated with neonatal epilepsy (Oyrer et al., 2018). Consistent with KCNQ2/3 channel expression in PV+/SST+ interneurons (Pelkey et al., 2017), the loss of these channels increased sIPSC frequency (Figure 1a; mean frequency: control 6.4 ± 0.5 Hz, n = 15; IN:Kcnq2/3 null 8.8 ± 1.1 Hz, n = 10; df = 23 t = −2.22 p=0.036 two-tailed Student’s t-test). Importantly, ablation of Kcnq2/3 from PV+/SST+ also increased sEPSC frequency in CA1 pyramidal neurons (Figure 1a; mean frequency: control 2.01 ± 0.16 Hz, n = 14; IN:Kcnq2/3 null 3.01 ± 0.35 Hz, n = 8; df = 20 t = −2.92 p=0.0085 Student’s t-test). This frequency increase was accompanied by a three-fold change in the miniature EPSC (mEPSC) frequency (Figure 1b; mean frequency: control 0.71 ± 0.11 Hz, n = 9; IN:Kcnq2/3 null 2.2 ± 0.4 Hz, n = 6; p=0.002 df = 13 t = −3.86 Student’s t-test), suggesting that elevating interneuron excitability led to secondary changes in excitatory synaptic drive. We did not find any changes in the miniature IPSC (mIPSC) frequency (Figure 1b; mean frequency: control 5.25 ± 0.48 Hz, n = 12; IN:Kcnq2/3 null 5.8 ± 0.6 Hz, n = 9; df = 19 t = −0.81 p=0.43 Student’s t-test), suggesting that the effect on sIPSCs was due to elevated interneuron excitability. The effects on the mEPSC frequency were likely a result of synaptic homeostasis in an effort to maintain a constant excitation and inhibition ratio. This is because an increase in mEPSCs, and consequently sEPSCs, would counteract the increases in the sIPSC frequency. Indeed, the sEPSC/sIPSC ratio (mean ratio: control 0.34 ± 0.03, n = 14; IN:Kcnq2/3 null 0.36 ± 0.04, n = 8), unlike the mEPSC/mIPSC ratio (mean ratio control 0.17 ± 0.04, n = 9; IN:Kcnq2/3 null 0.38 ± 0.05, n = 5; df = 12 t = −3.51 p=0.004 unpaired Student’s t-test), remained the same in neurons with or without PV+/SST+ KCNQ2/3 channels. Importantly, the effects on the mEPSCs were specific to changes in interneuron excitability, as we did not find any significant changes in the mEPSC frequency in CA1 pyramidal neurons from Kcnq2 pyramidal neuron knockout mice (Emx1Cre;Kcnq2f/f, designated as PYR:Kcnq2 null) (Figure 1). Rather, in PYR:Kcnq2 null neurons only the spontaneous frequency was elevated (Figure 1; mean frequency: control 2.01 ± 0.16 Hz, n = 14; PYR:Kcnq2 null 3.3 ± 0.46 Hz, n = 10; df = 22 t = −2.99 p=0.0067 Student’s t-test), consistent with the role of KCNQ2/3 channels in controlling pyramidal neurons’ axonal excitability (Battefeld et al., 2014). Ablation of Kcnq2/3 channels from PV+/SST+interneurons leads to increased excitatory transmission. (a) Top, representative sEPSC and sIPSC traces recorded from mouse CA1 pyramidal neurons (P15–P19) in acute hippocampal slices from control (number of animals = 8) and either Kcnq2/3 interneuron (IN:Kcnq2/3 null; number of animals = 4) or Kcnq2 pyramidal neuron conditional knockout (PYR:Kcnq2 null; number of animals = 3) mice. Bottom, cumulative distribution plots of sIPSC and sEPSC inter-event intervals recorded in pyramidal neurons of IN:Kcnq2/3 null and PYR:Kcnq2 null mice. Insets: summary graphs of average inter-event frequency. Statistical comparisons were performed with a one-way analysis of variance (ANOVA; p<0.05) followed by a Fisher LSD post-hoc test (*: p<0.05, **: p<0.001). For comparing sEPSC frequency: ANOVA F(2,29) =5.168, p=0.012; for control vs. PYR:Kcnq2 null p=0.0051; for control vs. IN:Kcnq2/3 null p=0.038. (b) Top, representative mEPSC and mIPSC traces recorded from mouse CA1 pyramidal neurons from control (number of animals = 6), IN:Kcnq2/3 null (number of animals = 3) or PYR:Kcnq2 null (number of animals = 4) mice, respectively. Bottom, cumulative distribution plots of mIPSCs and mEPSCs inter-event intervals recorded in pyramidal neurons of IN:Kcnq2/3 null and PYR:Kcnq2 null mice. Insets: summary graphs of average inter-event frequency. Statistical comparisons were performed with one-way ANOVA followed by Fisher LSD post-hoc test (*: p<0.05, **: p<0.001). For comparing sEPSC frequency ANOVA F(2,22) =10.74, p=0.0006; for control vs. PYR:Kcnq2 null p=0.3764; for control vs. IN:Kcnq2/3 null p=0.0002. Each data point represents recording from one pyramidal neuron. Data in summary graphs are represented as mean and s.e.m. Are the synaptic changes due to loss of KCNQ2/3 from PV+, SST+, or both types of interneurons? To address this question, we tested whether ablation of KCNQ2/3 channels alters the excitability of PV+ and SST+ cells in mouse CA1. We distinguished these neurons based on their intrinsic excitability and firing properties (Figure 2). We found that ablation of Kcnq2/3 from PV+-like interneurons led to an increase in the number of action potentials following suprathreshold depolarizing current pulses (Figure 2a). In contrast, ablation of Kcnq2/3 from SST+-like interneurons did not change their firing properties (Figure 2a). We obtained similar results for L2/3 interneurons, suggesting that KCNQ2/3 function is critical for PV+ interneuron properties across multiple forebrain regions (Figure 2a). To confirm our finding that KCNQ2/3 alters PV+ interneuron excitability, we tested the effect of ablating Kcnq2 and Kcnq3 from PV+ interneurons by developing Pvalbcre;Kcnq2f/f/Kcnq3f/f;Ai9 (designated as PV:Kcnq2/3 null) mice. Indeed, ablation of Kcnq2 and Kcnq3 increased the firing rate of PV+ neurons in the CA1 region (Figure 2b). The increased excitability in PV+ interneurons might have been due to their increased input resistance of Kcnq2/3 null neurons (Figure 2b; mean RIN: control 166 ± 16 MΩ, n = 15; PV:Kcnq2/3 null 257 ± 33 MΩ, n = 14; df = 27 t = −2.54 p=0.017 unpaired Student’s t-test). However, as application of the pan-KCNQ blocker XE-991 did not change the input resistance in control PV+ interneurons (Figure 2—figure supplement 3; RIN: control 169 ± 20 MΩ,+XE-991 143 ± 20 MΩ, n = 6; t = 1.355 df = 5 p=0.233), it’s unclear whether the change in input resistance in Kcnq2/3 null neurons is due to direct loss of KCNQ2/3 activity or an indirect effect. Next, we repeated our experiments in SSTcre;Kcnq2f/f/Kcnq3f/f;Ai9 neurons (Figure 2b; refer to as SST:Kcnq2/3 null). Consistent with our earlier finding, ablation of Kcnq2/3 from SST+ interneurons did not change their firing properties or input resistance (mean RIN: control 360.28 ± 34 MΩ, n = 6; SST:Kcnq2/3 null 327 ± 64 MΩ, n = 8; df = 12 t=−0.42 p=0.68 unpaired Student’s t-test). Loss of KCNQ2/3 activity leads to increased excitability of PV+interneurons. (a) Top, representative voltage responses from a +150 pA current injection step (1 s) in PV- and SST-like interneurons in either the CA1 region of the hippocampus (P12–P17) or L2/3 of the somatosensory cortex (P8–P11). For L2/3 recordings, cells were also confirmed by immunoreactivity against SST antibodies. Bottom, summary graphs showing the effect of deleting KCNQ2 and KCNQ3 channels on action potential number from CA1 PV-like (control n = 8/6; IN:Kcnq2/3 null n = 8/5), SST-like (control n = 19/8; IN:Kcnq2/3 null n = 8/4), and L2/3 (PV-like: control n = 10/7; IN:Kcnq2/3 null n = 8/4; SST-like: control n = 10/6; IN:Kcnq2/3 null n = 5/4) interneurons (Vh=-75 to −77 mV). For CA1 PV-like cells (P16–P25), F(9,126)=2.849, p=0.0043; for L2/3 PV-like cells, F(9,144)=3.845, p=0.0002); for CA1 SST-like cells (P15–P19), F(9,225)=0.601, p=0.7955; and for L2/3 SST-like cells, F(9,117)=0.326, p=0.965. Significance was determined using a two-factor mixed ANOVA. See Figure 2—figure supplement 1 showing that indeed SST cells express KCNQ2 and KCNQ3 mRNA. (b) Top, representative voltage responses to a series of current injection steps (1 s) in PV+ and SST+ interneurons in the CA1 region of the hippocampus (Vh=-75 to −77 mV). Bottom left, summary graph showing the effect of deleting KCNQ2 and KCNQ3 channels on action potential number from CA1 PV+ cells (control n = 15/8; PV:Kcnq2/3 null n = 14/7; F(9,243)=3.558 with p=0.0004). Middle left, summary graph showing that loss of KCNQ2/3 channels decreases PV+ input resistance (control, n = 15/8; PV:Kcnq2/3 null, n = 14/7; df = 27 t=−2.54 p=0.017 unpaired Student’s t-test). See also Figure 2—figure supplement 2 regarding PV+ Kcnq2/3 null neurons diversity of intrinsic properties. Middle right, summary graph showing the effect of deleting KCNQ2 and KCNQ3 channels on action potential number from CA1 SST+ cells (control n = 6/2; SST:Kcnq2/3 null n = 8/4; F(9,108)=0.729 with p=0.6814). Bottom right, summary graph showing loss of KCNQ2/3 channels did not decrease SST+ input resistance (control n = 6/2; SST:Kcnq2/3 null, n = 8/4; df = 12 t=−0.42 p=0.68 unpaired Student’s t-test). ‘n’ designates number of cells followed by number of animals. Each data point represents recording from one neuron. Data in summary graphs are represented as mean and s.e.m. Our data suggest that ablation of KCNQ2/3 channel activity from PV+ interneurons results in elevated interneuron excitability, which in turn could lead to remodeling of fast excitatory synaptic activity. As KCNQ2 pathogenic variants are much more frequent than KCNQ3 variants (Brenner and Wilcox, 2012), we also examined whether ablation of Kcnq2 alone could lead to similar effects. 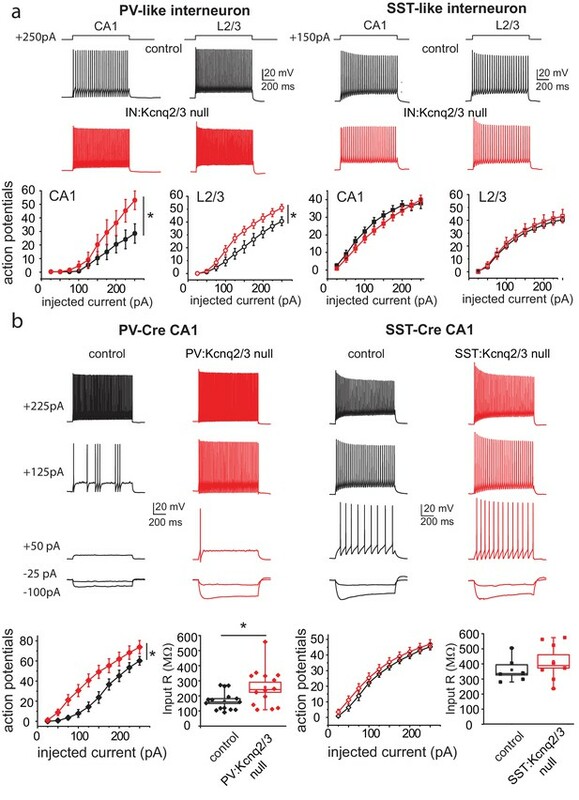 Indeed, we found that loss of KCNQ2 channels from PV+ interneurons increased their intrinsic excitability (Figure 3a) and the frequency of sEPSCs in pyramidal neurons (Figure 3c; Pvalb-Cre;Kcnq2+/+;Ai9 1.165 ± 0.12 Hz, n = 13; Pvalb-Cre;Kcnq2f/f;Ai9: 2.108 ± 0.22 Hz, n = 19; p=0.0098 Mann-Whitney test). The observed changes in the sEPSC frequency were not due to changes in the intrinsic excitability of pyramidal neurons (Figure 3b). To determine whether ablation of Kcnq2 from PV+-expressing interneurons affected the excitatory drive in vivo, we administered picrotoxin, a GABAA receptor antagonist. We implanted mice with bilateral frontal and parietal electrodes and validated generalized epileptiform activity coinciding with Racine scale Stage five seizures induced by intraperitoneal injection of picrotoxin (10 mg/kg) (Figure 4a). Thereafter, we video-recorded the latency to seizure onset without implantation. All of the mice lacking Kcnq2, including Pvalb;Kcnq2 heterozygous mice, reached Stage five seizure activity within 30 min, with a significantly reduced latency to seizure onset when compared to Pvalb;Kcnq2+/+ mice (Figure 4b). These data confirm that loss of KCNQ2 channel activity from interneurons can lead to excitatory network hyperexcitability in vivo. Ablation of Kcnq2 from PV+ interneurons leads to increased excitatory transmission in pyramidal neurons. For simplicity we refer Pvalb-Cre;Kcnq2;Ai9 mice in the figure as Pvalb-Cre;Kcnq2f/f or Pvalb-Cre;Kcnq2+/+. (a) Left, representative voltage responses from a + 200 pA current injection step (1 s; Vh= −75 to −77 mV) in PV+ interneurons from the CA1 region of the hippocampus (P23–P25). Right, summary graph showing the effect of deleting Kcnq2 on action potential number from PV+ interneurons (Pvalb-Cre;Kcnq2+/+;Ai9 n = 15/4; Pvalb-Cre;Kcnq2f/f;Ai9 n = 14/3; F(9,243)=3.558, p=0.0004). Significance was determined using a two-factor mixed ANOVA. (b) Left, representative voltage responses from a + 200 pA current injection step (1 s; Vh=-75mV) in pyramidal neurons from the CA1 region of the hippocampus (P30–P32). Right, summary graph showing the effect of deleting Kcnq2 from pyramidal neurons in action potential number (Pvalb-Cre;Kcnq2+/+;Ai9 n = 15/3; Pvalb-Cre;Kcnq2f/f;Ai9 n = 12/2; F(9,225)=0.4891, p=0.88). Significance was determined using a two-factor mixed ANOVA. (c) Left, representative sEPSC traces recorded from CA1 pyramidal neurons (P32–P35) in acute hippocampal slices from control and Kcnq2 null PV+ interneurons. Right, summary bar graphs of sEPSC frequency (Pvalb-Cre;Kcnq2+/+;Ai9 1.165 ± 0.12 Hz, n = 13/4; Pvalb-Cre;Kcnq2f/f;Ai9: 2.108 ± 0.22 Hz, n = 19/3; p=0.0098 Mann-Whitney test) and amplitude (Pvalb-Cre;Kcnq2+/+;Ai9 15.9 ± 0.86 pA, n = 13/4; Pvalb-Cre;Kcnq2f/f;Ai9: 15.3 ± 0.68 pA, n = 19/3; DF = 30 t = 0.62 p=0.5394). Statistical comparisons were performed with two-tailed unpaired Student’s t-test or Mann-Whitney when the variance between the two groups was significantly different. ‘n’ designates number of cells followed by number of animals. Each data point represents recording from one neuron. Data in summary graphs are represented as mean and s.e.m. In vivo hyperexcitability with loss of Kcnq2 in PV-expressing interneurons. (a) Using simultaneous video-EEG monitoring, Stage five onset was defined as the latency to rearing and falling with forelimb clonus, associated with bilateral epileptiform activity on EEG. 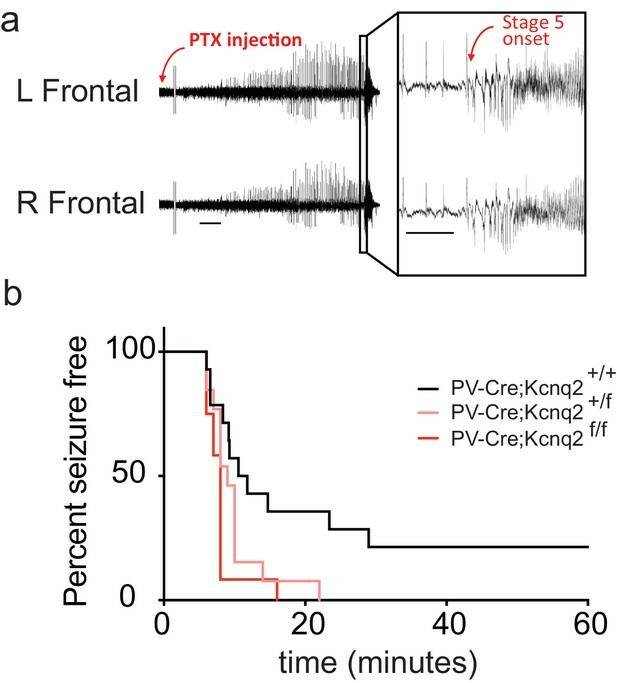 (b) Loss of one or both Kcnq2 alleles in PV-expressing interneurons led to significantly reduced latency to seizure-onset (p=0.0370 and p=0.0047, respectively, Log-rank (Mantel-Cox) test; Pvalb-cre;Kcnq2+/+ n = 14; Pvalb-cre;Kcnq2f/+ n = 13; Pvalb-cre;Kcnq2f/f n = 12). ‘n’ designates number of animals. Bar = 1 min, inset, 5 s.
In summary, our ex vivo and in vivo work reveals that changes in interneuron excitability induced by loss of KCNQ2/3 channel activity in PV+ interneurons could change the course of excitatory network development. Multiple studies have shown that early in development GABA-mediated transmission partly drives excitatory synapse maturation and formation in pyramidal neurons. This is because early in development pyramidal neurons have a depolarized GABA equilibrium potential(Le Magueresse and Monyer, 2013; Wang and Kriegstein, 2011), allowing GABA to provide a much-needed depolarizing signal to relieve magnesium block from NMDA receptors and in turn promote AMPA receptor unsilencing and synaptic input maturation. Indeed, recent work showed that pharmacologically blocking potassium channels with 4-AP to drive GABA release on newborn neurons led to robust formation of excitatory synaptic inputs, allowing for the integration of newborn cells to excitatory synaptic networks (Chancey et al., 2013). We thus speculate a similar mechanism might in play in our mice. Future work is needed to directly test this hypothesis. Importantly, our work suggests a unique mechanism compared to earlier work showing that loss of potassium channel activity critical for interneuron firing behavior leads only to depolarization block (Lau et al., 2000) and hyperexcitability through disinhibition. Therefore, our work raises the possibility that potassium channel dysfunction that elevates GABAergic transmission could also lead to remodeling of excitatory transmission in the cortex. Such changes might contribute to the severe neurodevelopmental effects seen in patients with potassium channel epileptic encephalopathy. All experiments were performed according to the guidelines described in the National Institutes of Health Guide for the Care and Use of Laboratory Animals and were approved by the Institutional Animal Care and Use Committee of the University of Connecticut, Storrs (Protocol: A16-031) and of Baylor College of Medicine (Protocol: AN-6600). For our experiments, we used both male and female mice. To generate interneuron or pyramidal neuron specific Kcnq2 and Kcnq3 conditional knockout mice, we crossed our previously generated Kcnq2f/f, Kcnq3f/f, or Kcnq2f/f/Kcnq3f/f mice with the following Cre driver lines obtained from Jackson laboratories. For pyramidal neuron Kcnq2 ablation we used B6.129S2-Emx1tm1(cre)Krj/J (Jax stock # 005628), whereas for interneuron Kcnq2 and Kcnq3 cell type-specific knockout mice we used C57BL/6J-Tg(Nkx2-1-cre)2Sand/J (Jax stock #008661), Ssttm2.1(cre)Zjh/J (Jax stock #013044), or B6;129P2-Pvalbtm1(cre)Arbr/J (Jax stock #008069). To visualize cells that underwent recombination we also crossed the interneuron specific mouse lines with tdTomato (Ai9) reporter mice B6.Cg-Gt(ROSA)26Sortm9(CAG-tdTomato)Hze/J (Jax stock #007909). The Pvalb and Kcnq3 are on chromosome 15 too close to each other (~7 centi-morgan separation) for rare recombination events to occur making it difficult to generate Pvalb-Cre;Kcnq3f/f mice. However, we were successful in generating a Pvalb-Cre;Kcnq3f/f mouse which we then crossed to Kcnq2f/f mice to generate a Pvalb-Cre;Kcnq3f/f;Kcnq2f/+. Constitutive Kcnq3-/-mice were described previously (Kim et al., 2016). Mice were genotyped by PCR using the protocol described on the Jax.org website. Data collection and analysis of the in vivo seizure experiments were performed blind. Mice (P8-P35) were anesthetized with isoflurane and rapidly decapitated. The brain was quickly removed and placed in ice-cold sucrose based cutting solution consisting of the following: 25 mm NaHCO3, 200 mm sucrose, 10 mm glucose, 2.5 mM KCl, 1.3 mM NaH2PO4, 0.5 mM CaCl2, and 7 mM MgCl2. Coronal or Transverse hippocampus slices including surrounding structures were cut at 300 μm using a vibrating microtome (Microm HM 650V-Thermo Fisher Scientific; or Leica VT1200S). Slices were then transferred in artificial cerebrospinal fluid (ACSF) consisting of the following (in mM): 125 NaCl, 26 NaHCO3, 2.5 KCl, 1 NaH2PO4, 1.3 MgCl2, 2.5 CaCl2, and 12 glucose and equilibrated at 35°C for 30 min, and then maintained at room temperature for at least 1 hr before electrophysiological recordings. Cutting solution and ACSF were saturated with 95% O2 and 5% CO2. All experiments were performed at room temperature. Whole-cell recordings were obtained using borosilicate glass electrodes having resistances of 2 to 4 MΩ. For current clamp whole cell recordings we used an internal consisted of the following (in mM): 130 potassium methylsulfate (or potassium gluconate), 10 KCl, 5 Tris-phosphocreatine, 10 HEPES, 4 NaCl, 4 Mg2ATP, and 0.4 Na4GTP. The pH was adjusted to 7.2 to 7.3 with KOH. CNQX (4 μm), D-AP5 (10 μm), and picrotoxin (100 μm) (Abcam) were added in all current clamp experiments (Figure 2 and Figure 3a) to block AMPA-mediated, NMDA-mediated, and GABA-mediated synaptic transmission, respectively. For synaptic activity recordings in voltage-clamp configuration we used an internal solution consisting of the following (in mM): 135 Cs-MeSO3, 8 NaCl, 10 HEPES, 0.3 EGTA, 5 QX-314, 0.4 Na4GTP, and 4 Mg2ATP. The pH was adjusted to 7.2 with CsOH. To measure mEPSC and mIPSC, 1 μM TTX (Abcam) was present after recording spontaneous synaptic activity. We recorded s/mEPSCs in voltage-clamp mode at −70 mV, which is the reversal potential for GABAA-mediated chloride currents when using a low internal chloride concentration. For s/mIPSCs were recorded at 0 mV the reversal of AMPA-mediated currents. For mEPSCs, we performed all recordings in the presence of 1 µM TTX to block action potentials. Recordings were performed using a Multiclamp 700B amplifier (Molecular Devices), low pass-filtered at 2 kHz, sampled at 10 kHz, and analyzed offline using either Prism 7 (Graphpad), Clampfit 10 (PCLAMP; Molecular Devices), Mini analysis program (Synaptosoft), or Origin eight pro (OriginLab). We implanted mice between the ages P30-45. For all mice we gave 48 hr post-operative recovery time before chemoconvulsive testing. Mice were implanted as previously described (Maheshwari et al., 2017). Briefly, mice were anesthetized with isoflurane (2–4% in O2) anesthesia and surgically implanted with silver wire electrodes (0.005 inch diameter) inserted into the epidural space over the somatosensory cortex (1 mm posterior and 3 mm lateral to bregma) and frontal cortex (1 mm anterior and 1 mm lateral to bregma) bilaterally through cranial burr holes and attached to a microminiature connector cemented to the skull. The reference electrode was placed over the right cerebellum (1 mm posterior and 1 mm lateral to lambda) and the ground electrode was placed over the left cerebellum (1 mm posterior and 1 mm lateral to lambda). For L2/3 recordings in Nxk2.1IREScreKcnq2f/f;Kcnq3f/f mice, we verified SST positive cells by including in the recording solution either biocytin (0.05%; Sigma, cat# B4261) or lucifer yellow (0.1%, molecular probes, cat# L1177). Slices were subsequently fixed overnight in 4% paraformaldehyde in phosphate buffer (PB; pH 7.4) at 4°C and rinsed with PBS. Using standard immunofluorescence approach slices were incubated with 0.1% Triton X-100 and 10% normal goat serum to block non-specific binding. Slices were then incubated with Alexa Fluor 488 streptavidin (Invitrogen; cat# S32354) or rabbit anti-Lucifer yellow (Invitrogen; cat# A5750) along with rat anti-somatostatin (Millipore; cat# MAB354). We used Alexa Fluor 488 anti-rabbit (Invitrogen; cat# A11034) and Alexa 647 anti-rat (Invitrogen; cat# A21247) as secondary antibodies. To prepare brain sections for FISH, mice were anesthetized with isoflurane and rapidly decapitated. Mouse brains (P19-22) were flash frozen embedded in OCT compound and coronal slices cryosectioned at a thickness of 14 µm and mounted on SuperFrost Plus Gold slides (Fisher Scientific). Sections were fixed in 4% paraformaldehyde for 15 min at 4°C, dehydrated in 50, 70, and 100% ethanol, and air-dried at room temperature. Fluorescent RNAscope in situ hybridization (ISH) was performed using an RNAscope Fresh Frozen Multiplex Fluorescent kit according to the manufacturer's protocol to perform target probe hybridization and signal amplification (Advanced Cell Diagnostics). Probes were purchased from Advanced Cell Diagnostics: somatostatin mRNA, Mm-Sst-C1 (catalog #404631), parvalbumin mRNA, Mm-Pvalb-C1 (catalog #421931), tdTomato mRNA, Mm-tdTomato-C3 (catalog # 317041-C3), Kcnq2 mRNA, Mm-Kcnq2-O1 (catalog #300031-C2) and Kcnq3 mRNA, Mm-Kcnq3-O1 (catalog #300031-C3). Probes for Kcnq2 and Kcnq3 were custom made targeting exons 2–5 and exons 2–4, respectively. Confocal images of FISH experiments were obtained using a Leica TSC Sp8 and confocal image files (lif) containing image stacks were loaded into ImageJ (version 2.0.0, NIH, RRID: SCR_003070). Analytical tests were performed in Origin Pro (v8.0951) or GraphPad Prism (7.03) to calculate t tests, Mann-Whitney U, Log-rank (Mantel-Cox), or ANOVA with post hoc tests. All t-tests were two-tailed. Outliers were determined by Grubb’s test (http://graphpad.com/ quickcalcs/Grubbs1.cfm). No statistical methods were used to predetermine sample sizes, but our sample sizes are similar to those reported in our previous publications. Potassium Channelopathies of Epilepsy, Jasper's Basic Mechanisms of the Epilepsies, Bethesda, Oxford University Press, 10.1093/med/9780199746545.003.0053. The Journal of Neuroscience 21:9529–9540. The Journal of Neuroscience 20:9071–9085. The Journal of Physiology 595:7249–7260. Thank you for submitting your article "Deletion of KCNQ2/3 potassium channels from PV interneurons leads to homeostatic potentiation of excitatory transmission" for consideration by eLife. Your article has been reviewed by Gary Westbrook as the Senior Editor, a Reviewing Editor and four reviewers. The following individual involved in review of your submission has agreed to reveal his identity: Hillel Adesnik (Reviewer #2). The reviewers have discussed the reviews with one another and the Reviewing Editor has drafted this decision to help you prepare a revised submission. Soh et al., demonstrate that deletion of KCNQ2/3 specifically from GABAergic neurons – and specifically from PV interneurons – increases their excitability, increases inhibition onto pyramidal cells, but more surprisingly, increases excitation onto the pyramidal cell network. The increased excitation can only be interpreted as a non-cell autonomous effect that the authors plausibly attribute to 'synaptic homeostasis' – although this is not demonstrated directly. Formally demonstrating homeostasis would require showing that the firing rates of pyramidal cells in the mutant mice are comparable to that measured in wild types despite the overall increase in synaptic input in the mutant mice, something that could be tested in brain slices with electrical stimulation to the Schaffer collaterals or application of a solution that drives spontaneous activity. But the conclusion is reasonable even without this piece of evidence. Perhaps most interesting is that deleting KCNQ2 channels from interneurons increases susceptibility to a chemoconvulsant, opposite of what might be simplistically expected from enhancement of interneuron excitability (and fitting with neonatal epilepsies associated with KCNQ2 mutations). The slice electrophysiology demonstrating differences in excitability between control and knockout interneurons is thoroughly and rigorously performed. The experiments concisely and succinctly demonstrate relevant changes in electrical properties (current-clamp) upon removal of KCNQ2/3 channels, however the KCNQ2/3 currents are not directly measured in any way. Nonetheless, this is an interesting and important work, and with the revisions as indicated below, could make a substantial contribution. The importance of this study is that it raises an intriguing notion that genetic mutations in KCNQ genes that give rise to epilepsy could be doing so not because of direct alterations to principal cell intrinsic excitability, but due to network changes associated with increased interneuron excitability. There is a notable mis-match in the nature of the animals used for the in vitro vs. in vivo experiments. The in vitro experiments were done with mice lacking both KCNQ2 and KCNQ3 channels, while the in vivo experiments used mice lacking only KCNQ2 channels. The authors say that most human mutations involve KCNQ2. However, while these mice may be most relevant for comparing to human epilepsies, they are different from those used to explore the excitability differences in the in vitro experiments, leaving open the question of whether loss of KCNQ2 alone would have similar effects as loss of both. Thus, there is an issue linking the two parts of the manuscript (and one that the authors never address, partly by virtue of not having a separate Discussion section following the Results section). This issue could be fairly easily addressed if the authors tested the key in vitro results – enhanced excitability of PV-like interneurons and enhanced excitatory input to CA1 – in mice lacking only KCNQ2 in interneurons. One approach would be to repeat the core findings on increasing excitation and excitability in the PV-Cre;KCNQfl/fl mice. Thank you for resubmitting your work entitled "Deletion of KCNQ2/3 potassium channels from PV interneurons leads to homeostatic potentiation of excitatory transmission" for further consideration at eLife. Your revised article has been favorably evaluated by Gary Westbrook (Senior Editor), a Reviewing Editor, and two reviewers. The manuscript has been improved but there is one remaining issue that needs to be addressed before acceptance. Specifically, the shorthand nomenclature for the mutant animals could be quite confusing for readers. The authors say (Results and Discussion section) they will use a designation of "IN:KCNQ2/3 null" for the mice, but then proceed in both text and figures to refer to the animals as simply "IN:KCNQ2/3", which is quite confusing. Someone first looking at the paper by scanning the figures could easily assume that the authors are over-expressing KCNQ2/3 in interneurons or selectively restoring KCNQ2/3 in interneurons in an otherwise null mouse – very confusing. I would recommend using "IN:KCNQ2/3 null" everywhere. We agree with the reviewers and have now performed the suggested experiments in PV+;Kcnq2f/f;Ai9 and PV+;Kcnq2+/+;Ai9 mice. We have included the additional results in the manuscript and also display them as a new Figure (Figure 3). We now report that loss of Kcnq2 from PV+ interneurons increased their intrinsic excitability (see Figure 3). We also recorded spontaneous EPSCs (sEPSC) in pyramidal neurons from the CA1 region from animals lacking Kcnq2 in PV+ interneurons. In agreement with our previous data, the loss of Kcnq2 led to an increase in the sEPSC frequency (control: 1.165 ± 0.12 Hz, n=13; PV-Kcnq2 KO: 2.108 ± 0.221 Hz, n=19; P=0.0026). To ensure that the observed changes in the sEPSC frequency were not due to changes in pyramidal neurons intrinsic excitability we also recorded the firing properties of pyramidal neurons from the PV+;Kcnq2f/f;Ai9 mice. We did not find any differences between the two groups (see new Figure 3). Thus, loss of either Kcnq2 or Kcnq2/3 from PV+ interneurons leads to elevated excitatory synaptic transmission in pyramidal neurons. We agree that our nomenclature could be confusing. We have now used find and replace in the word document and to replace all IN:Kcnq2/3 with IN:Kcnq2/3 null. We also corrected the figures. For consistency we also replaced PV:Kcnq2/3 with PV:Kcnq2/3 null, SST:Kcnq2/3 with SST:Kcnq2/3 null, and PV:Kcnq2 with PV:Kcnq2 null. Finally, we found a typo in the manuscript which have now corrected. Kcnq3-/- should have been labeled Kcnq3f/f. We have made this change now. We thank members of our labs for comments on our manuscript. This work was supported by grants to AVT and AM. Animal experimentation: All experiments were performed according to the guidelines described in the National Institutes of Health Guide for the Care and Use of Laboratory Animals and were approved by the Institutional Animal Care and Use Committee of the University of Connecticut, Storrs (Protocol#: A16-031) and of Baylor College of Medicine (Protocol#: AN-6600). © 2018, Soh et al.